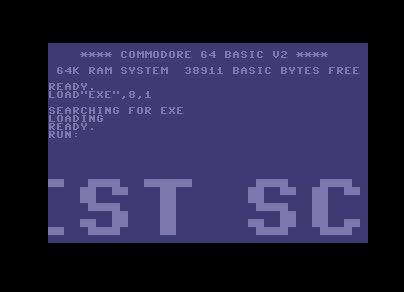 This source code shows you a simple way of displaying the classic oldskool scroller of an expanded 1×1 charset to 8×8 characters on the screen. This version includes reading the ROM charset if you don't decide to include your own. People can of course alter the code to different constraints of their liking, but this is just the simple 8×8 approach. The code may not be the most optimised either, as this is just to help new coders to understand the routine. The source code is in KickAssembler format, so make sure you know how to use the assembler before trying out the code. KickAssember variables used in routine. :BasicUpstart($0810)  // Include basic start. sei                   // Halt any interrupts. to the reserved zeropage addresses. sta $d01a             // interrupt request register to 1.
lda #$7f              // Set CIA interrupt control register. sta $01               // full RAM with I/O. lda #<irq             // Set irq and nmi vector locations. lda #$f8              // Set raster line required in irq. sta $d011             // clear the MSB of raster line. lda $dc0d             // Latch CIA irq control register. cli                   // Clear interrupt flag. bvc *                 // loop here. Beginning of the irq routine. Check if requested raster line has reached. This is optional if you want to use the ROM charset. sta $01               // character ROM access. Scroll 8 lines of screen memory by one char to the left. does the job at least. The 8x scale font scroll routine starts here. lda (scroll),y        // read scrolltext char, Z=? sta scroll+1          // scrolltext to the zeropage addresses. when viewed on the screen, making the text more readable.
! :cmp #$20              // * Z=0, check if char is a space, Z=? two reserved zeropage address to allow char pixel reading. inc scroll            // Increase scrolltext read pointers. iny                   // and store into an 8 byte buffer. Branch here is a character is still to be printed. lda #<scrmem          // memory to be written to. current character column pixel to the screen. lda #$40              // Set your display character here. asl charbuff,x        // Bit shift character buffer left once, C=? ror                   // Invery display character via the C flag. sta (chardata),y      // Store display character to screen memory. adc #$28              // screen memory. dex                   // How many rows left?, X-- N=? bpl print_char_loop   // if N=0, take branch. sta $01               // state before the scroll routine was executed. .text "hi there! this is a test scrolltext for the tutorial routine on how to write a simple 8x scale font scroller, using "
.text "a selectable character to write to screen memory. the source of this routine can be found at http://codebase64.org/"
.text "  ...feel free to do modifications or possible optimisations if you plan to use a routine as such as this one!       " .text "coded by conrad/onslaught/samar,  2nd january 2008.             wrap...          @"